Rhys qualified in Cardiff in 1996 and moved to North Devon in 2004. He has been a partner at Torrington Dental Practice since 2005 and has special interests in treating anxious patients and advanced restorative dentistry. Rhys completed the PG Dip in conscious sedation from Newcastle University in 2009 and has extensive experience in treating the most anxious patients. He is the clinical lead for sedation at TDP and has been involved in the growth of this service over the past 12 years. He is involved in mentoring other dentists and nurses in gaining the clinical skills to undertake sedation, is an immediate life support instructor and has been teaching this in the southwest for the past 10 years. Rhys is currently undertaking a masters degree in restorative dentistry in Plymouth Uni. He treats complex cases involving all aspects of restorative dentistry. He has so far gained the Certificate in Restorative Dentistry with distinction. 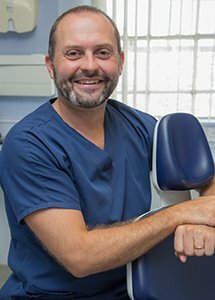 He has also gained a wealth of experience working alongside Ian Mills and the implant team in treating the more complex implant cases involving restoring many or all missing teeth. Outside of work Rhys has a been a professional trumpet player, is involved in coaching junior rugby at Barnstaple rugby club, enjoys playing sport, when his knees aren’t broken, and spending time with his wife and two children.